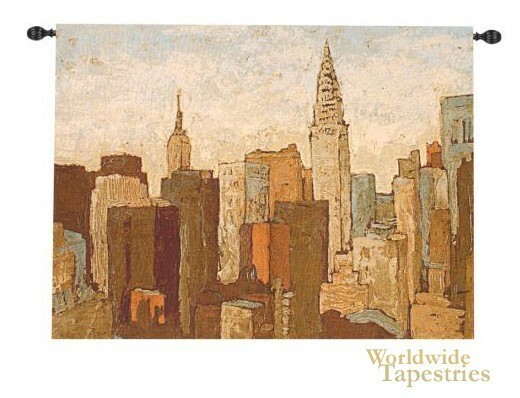 This modern art "City and Sky II" tapestry shows a stylised scene of New York City. Here in this work, we see a glorious cohesion of warm autumnal colors with oranges, olives, beiges contrasting with the cooler blues. The buildings and skyscrapers are depicted in an illustrative, comic book like style, bordering on impressionism. This is a lovely art piece showing the city skyline in a most artistic way. City and Sky II tapestry is backed with a lining and has a tunnel for easy hanging. Note: tapestry rod, where pictured, is not included in the price.